While the open section saw some tense battles without producing many decisive results, the women’s championship was a full-fledged bloodbath that ended with a full board of decisive results! In the open section, the round started with some very intriguing narratives. 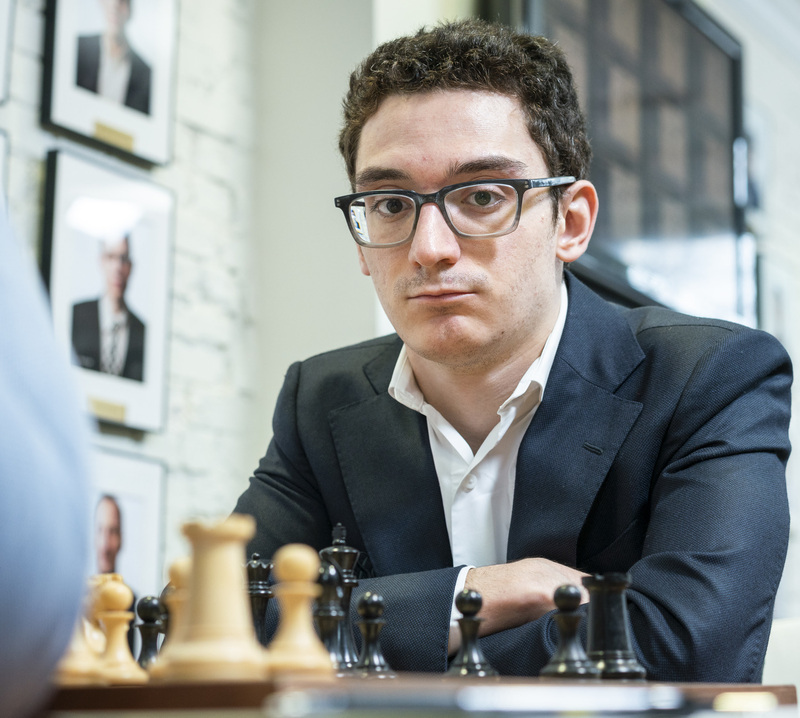 In his match against Sevian, Caruana decided to borrow some ideas from his World Championship match, employing the Sveshnikov Sicilian as his opening of choice. This must have come as a shock to his young opponent, as Fabiano rarely strays away from his pet Petroff Defense. Sevian chose a solid approach and wittily avoided the sharp lines available. Both players kept their kings safe and played a precise game that never really experienced any imbalances. Dominguez, the newly minted American super GM, contained every ounce of initiative from Akobian who had to accept a rather dry draw after a sequence of massive exchanges early in the game. 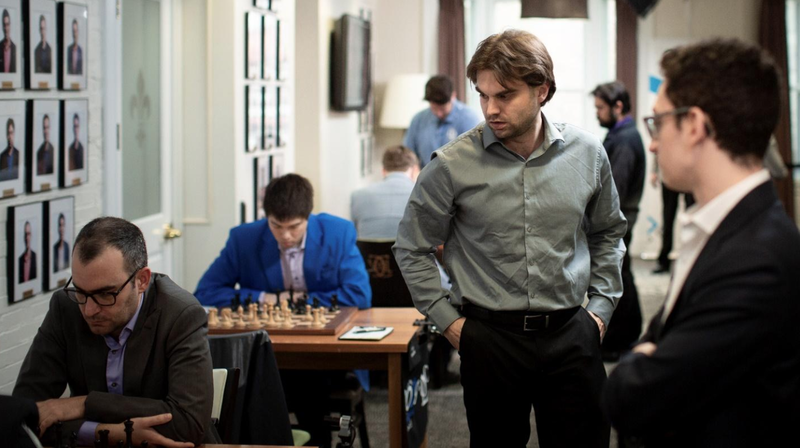 The players shook hands at move 33 in a symmetrical rook endgame. The reigning champion, Sam Shankland, came very well prepared to the game and obtained a risk-free endgame advantage. Despite being under pressure, Robson kept a calm profile and slowly but surely defused his opponent’s pressure. The final test came when Robson had to calculate and make sure that his tactical transition into a pawn endgame was going to be soundproof. The endgame was a draw and the players shook hands at move 49. Nakamura was another player that came very well prepared, but unfortunately for him he faced one of the leading experts of the opening in Wesley So. Black took his time in understanding the nuances of the position, and quickly simplified the position into an equal bishops of opposite colors endgame. The players called it a day at move 32. 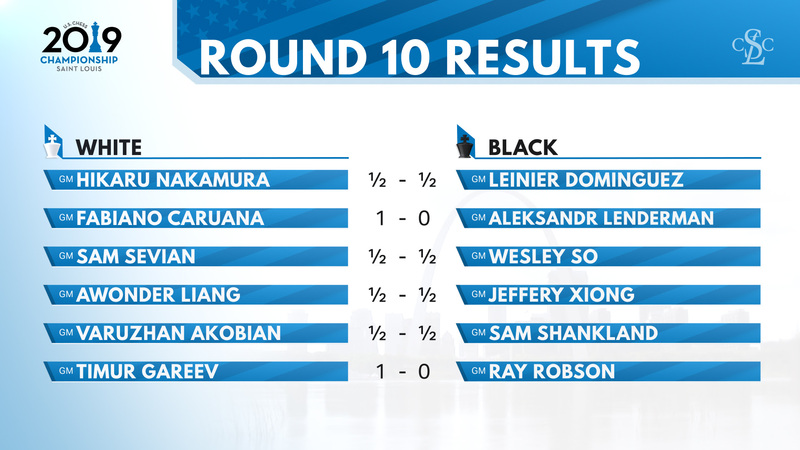 An eventful clash was the one between Awonder Liang and Alex Lenderman. 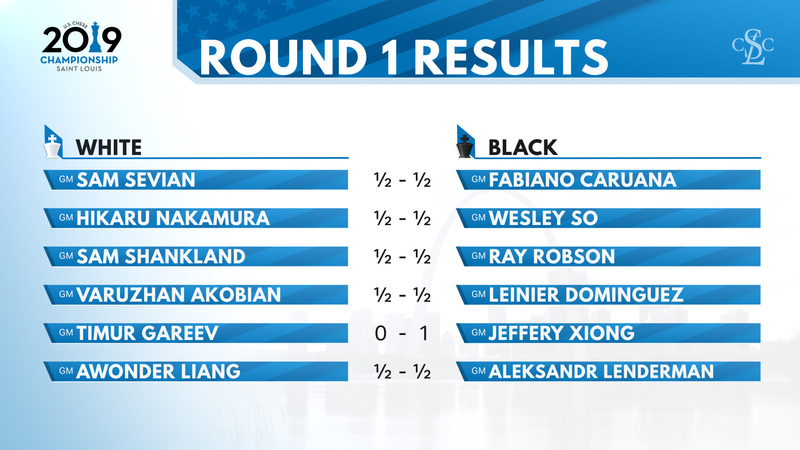 Lenderman got the upper hand first after Liang allowed Black’s knight to get to f4. Nevertheless, after a series of imprecise moves, Black’s piece confluence on the kingside proved to be rather an overextended construction as White’s pieces started picking at them tirelessly. White got the decisive advantage but blew it all away with the careless 36.Nd7? This allowed Black back into the game, and even more than that, after another blunder by White with 38.Kxe3? Despite the decisive advantage, Lenderman did not manage to convert the technical endgame and the game ended in a draw at move 120. 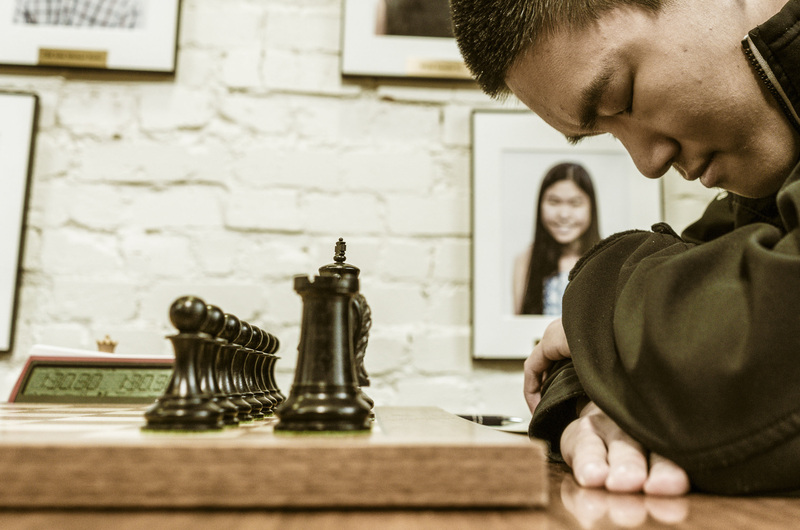 The only decisive game of the day in the open section was the clash between Gareev and Xiong. The colorful Gareyev opened the game with an early pawn storm on both sides of the board. While this seemed overly enthusiastic, his position was not all that bad due to his bishop pair and space advantage. On the other side of the coin, Xiong persuaded his aggressive opponent to continue pushing his pawns and create positional weaknesses. Unfortunately for Gareyev, his time management was not optimal and he found himself needing to handle an overly complex position where every move could blunder the game. The ladies came to play! While there was only one decisive game in the open section, all games in the women’s section finished in decisive results. It was a tense battle between the exuberance of the youth, and the calculated pace of the experienced, let’s take a closer look at each individual encounter. 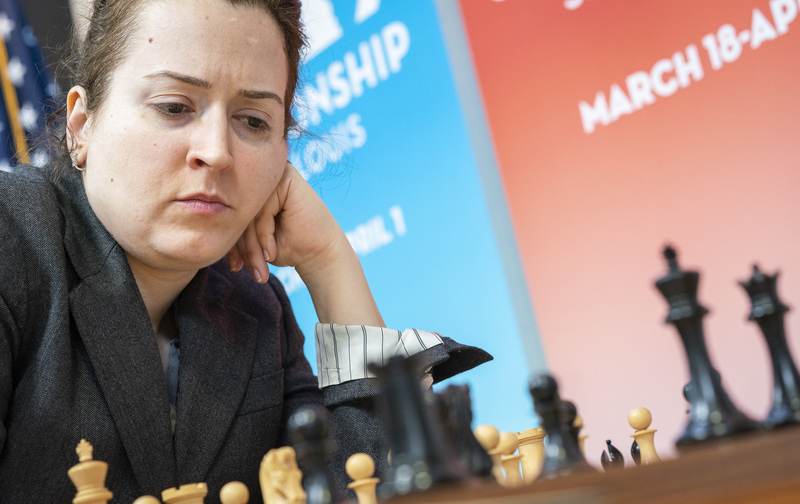 The seven-time national champion, Irina Krush, started off in quite a rocky fashion. 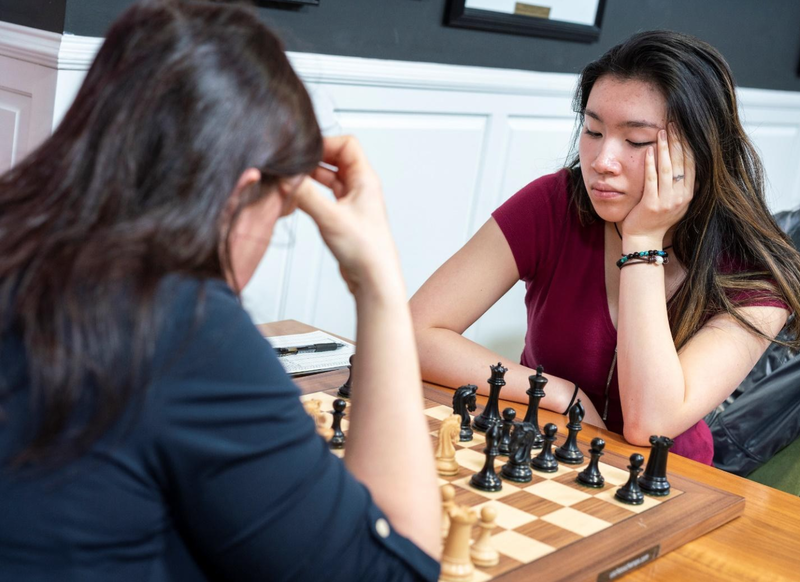 Her young opponent, Emily Nguyen, played the Black side of a solid Cebanenko Slav. Irina decided to force things in the center, but failed to correctly assess her opponent’s strong pawn break that left her structure I shambles. With heavily weakened dark squares, Irina struggled to find counter play, but just as the situation was starting to look very grim for White, Emily allowed a powerful central expansion with the careless 32…Nf6? 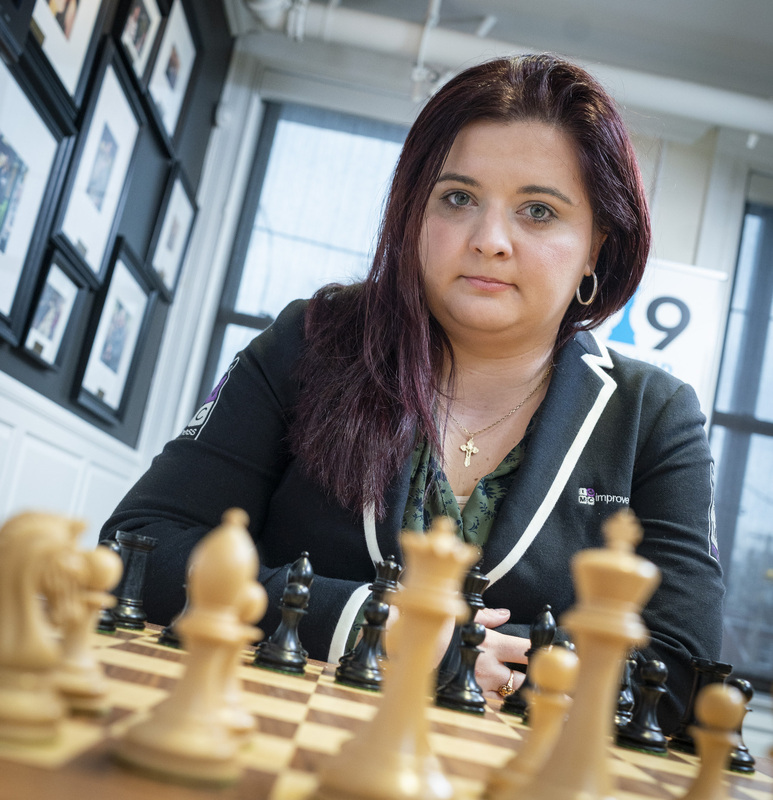 This allowed Krush to begin her offensive and put her young opponent under extreme pressure, which ultimately paid off when Nguyen blundered with 35…Rf8? This led to a smooth victory for White. Abrahamyan had to face against another talented youngster, Maggie Feng. The game started off as a French, and Abrahamyan looked to be the better prepared player. 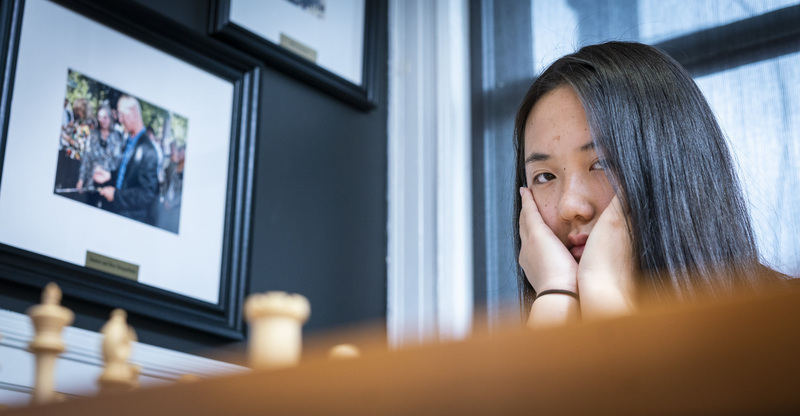 Unfortunately for her, Maggie Feng kept a composed profile under pressure and slowly subsided White’s initiative. The players entered an endgame which proved to be very good for Black due to the presence of the outside passed pawn on the “a” file. Feng showed pristine technique as she slowly pushed Abrahamyan’s pieces back and decisively converted her advantage into a full point. 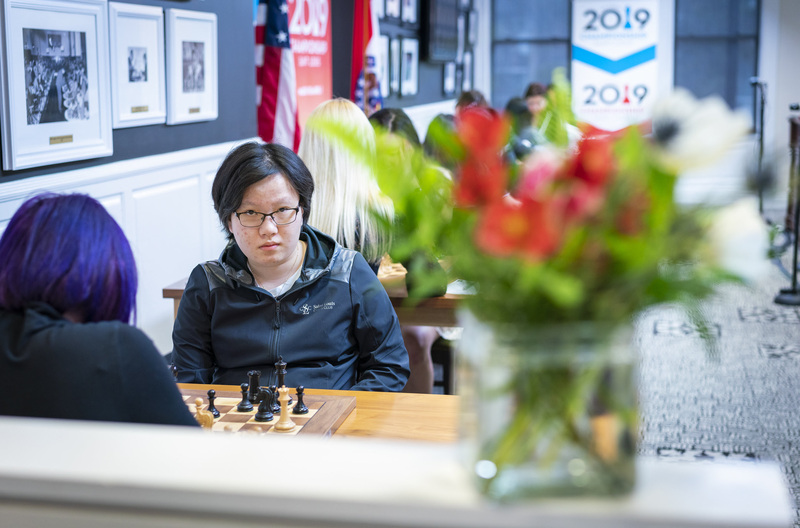 Annie Wang showed why she is one of the most exciting prospects in American chess last year, when she almost succeeded in breaking all the rules and winning the title. And while the first time she failed to complete the task, she is undoubtedly entering this year’s edition as one of the favorites to win it all. This game surely proved that she is a force to be reckoned with, as she skillfully outplayed her opponent in a complex middlegame. Another explosive encounter was the game between Anna Sharevich and Jennifer Yu. (Analysis available online). 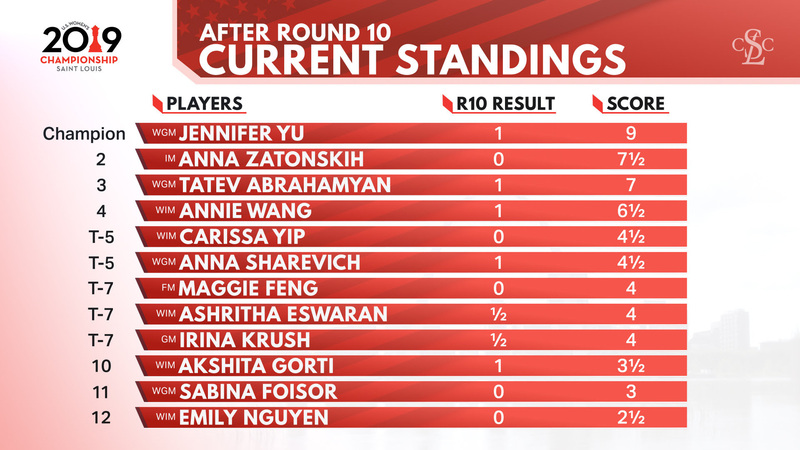 Carissa Yip is one of the biggest talents in American chess, and her recent results have proved that she is in good shape coming into this event. Sabina Foisor, the 2017 champion, has always been a fierce competitor therefore this matchup was likely going to produce fireworks. And it did. Sabina obtained a good position out of the opening but failed to tame the middlegame complications and swiftly fell into an unpleasant defensive situation. Carissa handled her initiative well but almost gave it all away with 39. Qg4?! Fortunately for her, Sabina immediately responded with a huge blunder of her own which simply gave the game away. One of the big favorites of the tournament, 4-time champion Anna Zatonskih, played a smooth technical game against the young Akshita Gorti. Her handling of the central pawn majority was a masterpiece and she precisely converted her assets into a full point. 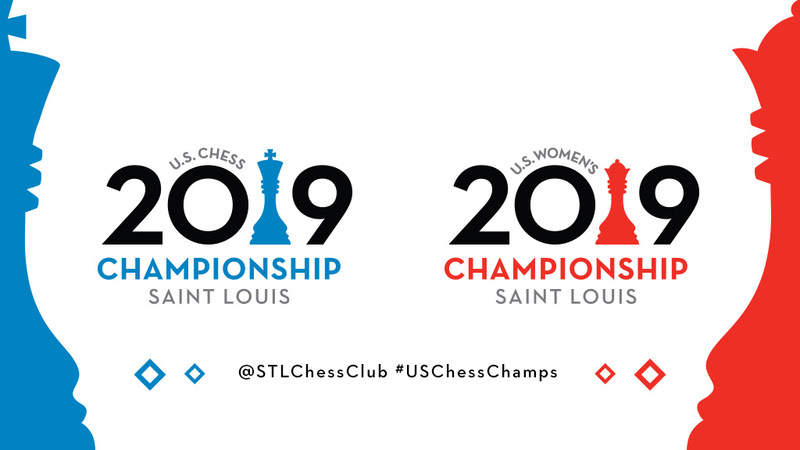 The penultimate round of the 2019 U.S. Championships couldn’t have been more exciting, as the players came in ready to work extra hard for their respective goals. 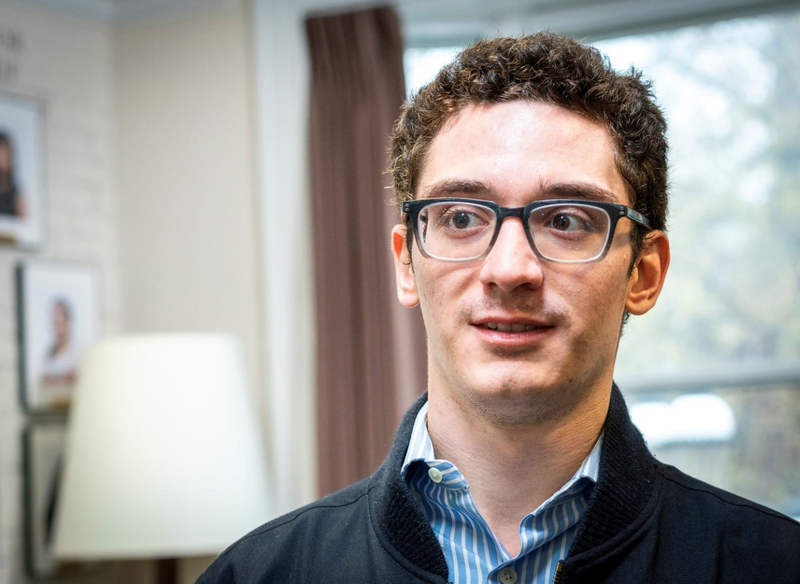 Fabiano Caruana completed the comeback, as he demolished Lenderman in the Petroff. The two leaders, Nakamura and Dominguez, took no major risks in their direct encounter and drew their game quickly. So fought valiantly to stay in the mix but was cut short by Sevian, who played a wonderful game and almost beat the former champion. Fortunately for So, he managed to save the game and will now need a victory tomorrow to hope for a tiebreak. His chances are slim, nevertheless, in chess everything is possible. 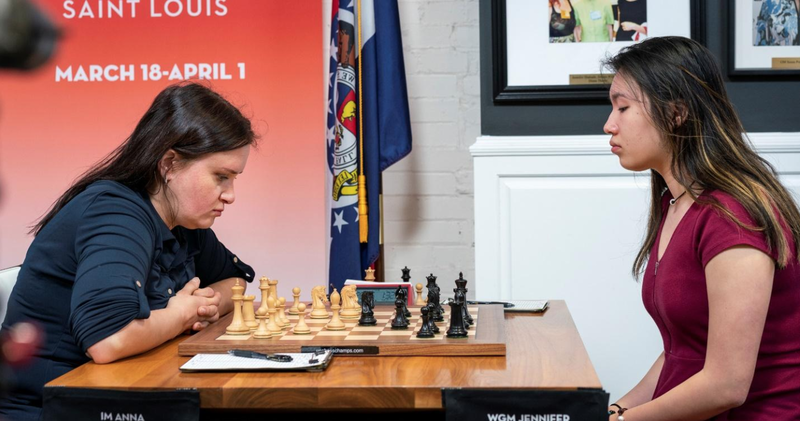 The big story of the round happened in the women’s section, as Jennifer Yu was crowned the new queen of American chess after defeating Anna Zatonskih, her most ardent rival, in their direct encounter. The tension was high throughout the game, as both players gave their all to reach their goals. Abrahamyan and Wang both scored important victories, and they will be fighting tooth and nail for the remaining medal spots. 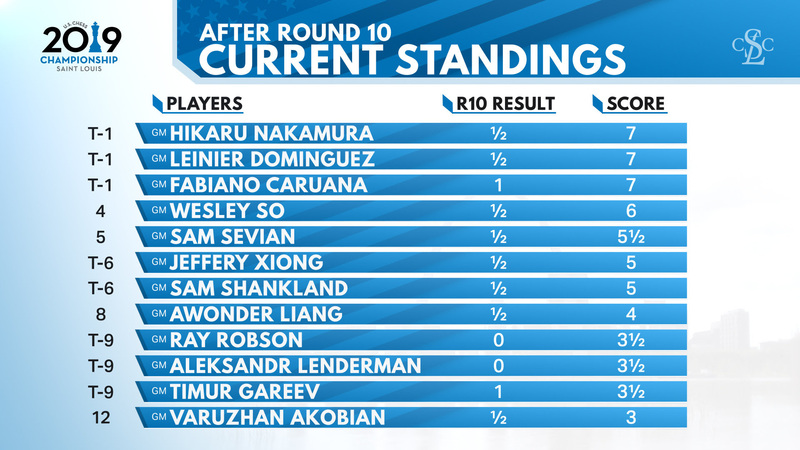 They will go into the final round separated by half a point, with everything to play for! 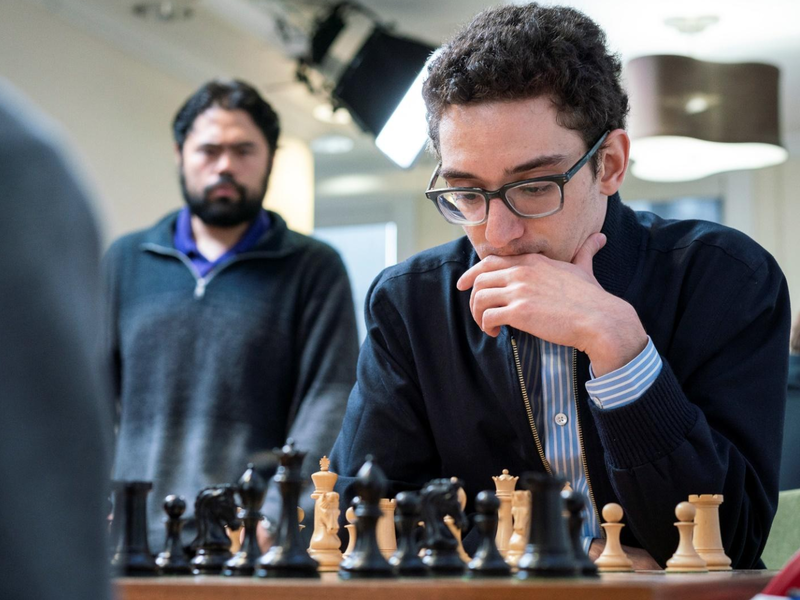 With the two leaders likely heading toward a draw, Caruana knew exactly what he had to do in order to keep his title chances alive. A win on demand was the only satisfying result. Caruana was aware of that as he mentioned it often during his interviews. Lenderman has been off-form throughout the event and still looking to find that elusive victory. In our short chat after the game, Lenderman confessed that he wanted to give Fabiano a way to over press and commit errors, as a victory for Lenderman would help him on his bid to reach one of the world cup spots. Lenderman chose the Petroff, a decision that some people might call naïve as Caruana is by many accounts the biggest expert in this opening. The position quickly became very unpleasant for Black after he erred with the imprecise 9…Nb4?! This allowed Caruana to obtain a better structure and the advantage he needed to start pressuring his opponent. The ensuing middle game position was one that you never want to have against a top player, a worse position without any counterplay. Let’s take a closer look at what transpired during this key match of the day (analysis available online)! We are all set for an explosive finish in the championship round today! This was clearly the game that commanded everybody’s attention throughout the day. The two players were separated by only half a point, and this match could have flipped the script as Zatonskih had the White pieces and a clear shot at upsetting the leader. The ladies quickly blitzed out the first 15 moves of a known line of the Slav. It was Zatonskih who had the first long think of the day, as she contemplated her plan and decided to go for the committal 16.Rd4 idea. Yu responded with the consolidating 16…a5 and it was at this point that Zatonskih made a big strategic mistake, 17. h4?! This was simply too much, as Zatonskih launched into a flank offensive without bringing any pieces to support it. A better course of action would have been to finish her development and create a strong battery on the d-file via the Qc2-Rd1 maneuver. Yu took advantage of her opponent’s carelessness by playing the ultra-concrete 17…Nc5! This was without a doubt the most difficult move of the game, as she had to calculate countless tense and sharp lines to make sure it worked. The ensuing complications were handled with precision by Yu, and Zatonskih erred under the looming threat of mass exchanges. Her 20.Nxe5? mistake allowed Yu to get a decisive advantage after 20…Bxf2, and she never looked back. It was all Yu until the end, as she forced Zatonskih’s resignation through a brilliant assault against her opponent’s king. 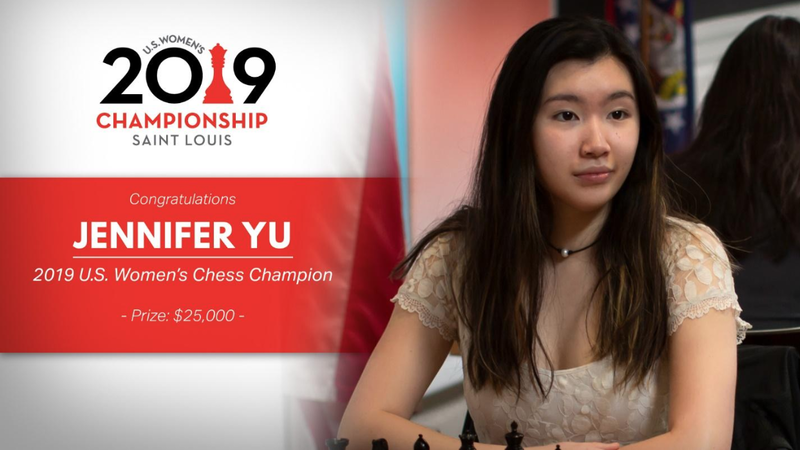 The young Jennifer Yu becomes the 2019 U.S. Women’s Chess Champion in style, as she scores a whooping 9/10 and takes the coveted title home with one round to spare! An explosive round here in Saint Louis, and we are all looking forward to see how the rest of the event will unfold!